Released the same year as “Bee Thousand” and about a thousand other EPs, “Fast Japanese Spin Cycle” represents a time when Guided By Voices were often on point with their prolific output and produced more hits than misses. Clocking in at just more than ten minutes, this EP contains some of Robert Pollard’s best pop fragments. Opener “3rd World Bird Watching” begins with only piano and vocal accompaniment of the most perplexing variety. Strangely or maybe logically, the near esoteric quality of Pollards lyrics work fine the more condensed and punchy he keeps his numbers. This continues whether the songs have pop hooks such as with “My Impression Now,” or simply attack in bits like “Snowman.” Repeated listens are easier with shorter track times, so these ditties seem to create pathways in your brain that worm Pollard’s bizarre statements into your mind. The B-side is even more interesting, with radically altered versions of previously released material. “Marchers in Orange” is less hazy, more rocking, while “Dusted” sounds much more improved in about every way. 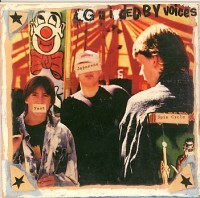 “Kisses to the Crying Cooks,” part of the medley that opens GBV album “Propeller,” is also acoustic and more poignant.